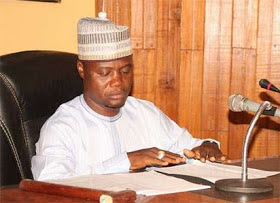 The crises rocking Kogi State House of Assembly took a new dimension yesterday, as, unexpectedly, the Speaker, Umar Ahmed, resigned his position. Ahmed’s resignation came exactly a week after the 25-member House passed a vote of confidence on him and less than 48 hours after the Assembly was invaded by hoodlums that disrupted plenary. The ex-Speaker, Ahmed, in the letter dated August 3, said he decided to throw in the towel to avert plunging the state into another round of crises and to save his life, which has been under intense death threat. In his acceptance speech, the new Speaker, Kolawole, expressed gratitude to the members for reposing confidence in him, promising to do his best to take the assembly to enviable heights. It was, however, gathered that it took the intervention of Senator Smart Adeyemi, who brokered peace between the Assembly and the executive to ensure the “amicable” resolution, prompting members of the House, which had initially adjourned indefinitely, to swallow their pride and call for a sitting 24 hours after the hoodlums’ invasion.